Each bundle contains 3 one-hour webinars and aligns with one of the Arizona Early Childhood Workforce Knowledge and Competencies. In addition, each bundle contains printables, videos, activities, and additional resources. You will gain valuable knowledge and develop strategies for working with families. To receive credit on your education and training report through the Arizona Early Childhood Workforce Registry, submit the certificates of completion for each webinar along with a completed Sesame Street Bundle Review form to the instructor listed on the course description. 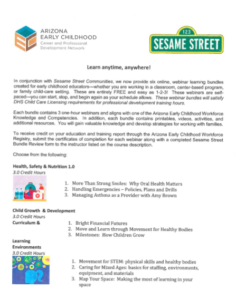 Follow the link here to a 7-minute webinar that will show you exactly HOW to register for the Sesame Street courses through the Arizona Early Childhood Workforce Registry. To find out more about each bundle, follow the link here or click on the picture to the right!